Graphic Design is the process where things get resolved through visual representation. All the problem-solving activities take place graphically and they explain the whole problem and its solution so well that it can never get any better any other way. Graphic designers are the one who has expertise in the designing these graphics for people and converting thoughts into pictorial representation. Graphic designers create symbols and then combine them up to convert in the form which makes some sense for the audience. It is represented in a way that it depicts all the ideas and messages and convert it into a logic and transferred to human mind for understanding. Art & design has earned a lot of credibility in today’s world as there is an era of graphical representation in each and everything of life. In this world of technological advancement, people have become more aware of these technologies which they were not in the early eras. Art and design have made its place in the modern world and its education. Now a day children are very much interested in attaining this education and serve further as it is a demand of the world nowadays. Graphic designers are the ones who have taken up the market and all the industries and have implemented this concept worldwide. All the printing companies have moved to the graphical representation of patterns, messages, and thoughts which has obsoleted theoretical presentation. They create the ideas and process them further. There are numerous types of designs in the market which are represented by graphic designers on the basis of their expertise. These are further allotted in the market and in the center of business as per the demand of client. Description of work, hours spent, hourly rate and quantity of work. 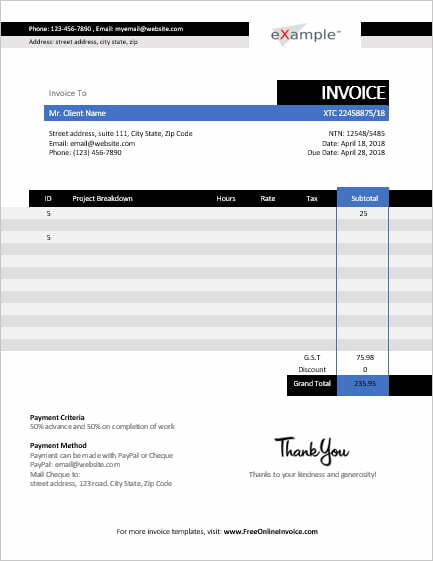 This Graphics Designer Invoice is created in MS Word in a modern and stylish layout. You can print it on an A4 page.